This book is the Christian answer to the going green movement publications which stem out of New Age principles and progressive political agenda. Rebecca White co-authors with her mom, Karen Whiting. The book opens up with the ABCs of going green and the corresponding chapter that deals with it. For instance, Q is for Quiet yourself, sit outside, and listen to the sounds of nature (Chapter 1). One does not have to read the book in order. Just pick a topic you are curious or passionate about, look up the chapter and go. But this book is more than just a collection of theoretical advice. It contains activities (how to create recycled jewelry, how to plan a spa day with friends, how to team up to clean up a park), recipes (from whole-wheat doggie treats to kale chips and carrot-zucchini muffins), science experiments (oil spill cleanup) and games (animal signs scavenger hunt). I don’t know about you, but I am a planner. Time is holy, in my opinion. It’s probably the most important gift God has given us and I do not take it for granted. I have read so many time management books, but I can never get enough of them. When I read Karen’s book on time, I knew I found a gem I can recommend to others. Why? Because, unlike other books I have recommended here about getting organized and planning your time better, this one comes from a biblical perspective. 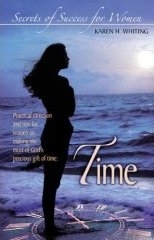 As such, “Time” helps a Christian woman bring her workload to the Lord. Not only are the burdens left at His feet, but the assurance is there that He will help you prioritize and, ultimately, accomplish His will. From ways to schedule your day, to gracious ways of saying “no” when asked to take on one more responsibility, this book is filled with godly advice. Even though it is a small book, the words and principles shared are deep. I found myself re-reading the same sentence over and over again. I wanted to make sure I really got the whole meaning behind the words. This book would make a great gift to any graduate. Also, homeschooling moms or any moms, for that matter. This book is part devotional and part craft projects. It is intended for tween girls, but my six-year-old son really got into this project. It’s not surprising to me because he has been building with LEGO bricks for two years now. He likes everything small. He and I built the hanging flower pot, the shelf, the books for the book shelf, and then the skateboard. We skipped over several pieces of furniture because we did not have the necessary materials. But I put them on a shopping list and next time I go to the craft store I will be sure to equip us so we can finish this room. My four-year-old daughter was pleased to make a hanging basket and some of the books on the shelf. I like the design of the book – very feminine. I also enjoyed the truths shared in the book (God made you special in every detail, for instance) and the parallels Karen draws between a mini-bedroom and our lives. You know all those distorted beliefs we have about ourselves? Here’s a book that sets the record straight about your identity in a gentle, non-preachy way. So either get your daughter started right, or help her correct these distorted beliefs with this practical, fun and faith-filled book. 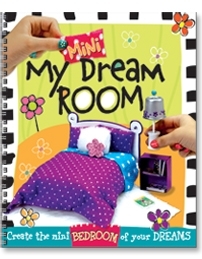 This book will help you create many memories with your sweet daughter. What is sweeter and more innocent than a preschool age little girl? I am in awe every day at the things my daughter says and does. This book has helped me carve out time just for her. I usually do devotions with both my children, but I read somewhere that it would be a good idea to take time with each child individually. I don’t always know what to say or how to lead her mind in the paths of righteousness. So this book serves me as a guide to work from. Also, if you are looking for a Christian alternative to Disney princesses, this book will help you. The two princesses on the cover are Elizabeth (the brunette) and Lily (the blonde). If you email Karen about it, she will send you templates so you can make puppets of the two princesses. That way, you and your daughter can have even more fun playing and learning together. Also, she has prayer cards, a princess memory game and even a coloring page. My daughter and I have played with the cards and it’s really neat to see her reactions when she finally gets a pair of cards guessed right. The games are a great way for me to relax and connect with my daughter as peers, as fellow game players. Co-authored with Mary Rose Pearson, this book is a collection of teaching activities for small children. Children learn best by playing and we all know how much little ones enjoy playing with their hands and fingers. Whenever we memorize Scripture, we have hand motions and finger plays to help us. So I know this will come in handy whether you run a Sabbath/Sunday School class or do regular devotionals at home with your children. 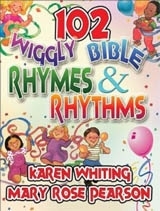 Repetition and multi-sensory learning are methods used in this book and we know they work. There are brief instructions on how to introduce a new song or activity, if you should need some guidance. Personally, I really enjoyed the Relaxer Rhymes. There are three of them and I have almost all of them memorized. We are not very formal in our homeschool, but sometimes I do need their full attention. These rhymes that help them relax, calm down and sit down quietly are perfect. You can connect with Karen Whiting by visiting her website. I received a free copy of each product above in exchange for my honest review. I was not required to write a positive review, nor was I compensated in any other way. The Amazon links above are affiliate links. All opinions I have expressed here are my own or those of my family. I am disclosing this in accordance with the FTC Regulations. © Adriana Zoder and Homeschool Ways, 2013-2019. Unauthorized use and/or duplication of this material without express and written permission from this blog’s author and/or owner is strictly prohibited. Excerpts and links may be used, provided that full and clear credit is given to Adriana Zoder and Homeschool Ways with appropriate and specific direction to the original content.